The property was very nice. You couldn't be the view! Unfortunately The weather was uncooperative and too cold to really enjoy the beach area, which was the primary reason for visiting. Just some bad luck for us. If it had been warm we would haves loved everything about our stay at Navarre Beach. The weather was wonderful. The condo location is great. Your staff is very easy to work with. The condo has a beautiful view and comfortable beds. We just wish the Living Room couches were comfortable. The staff was friendly and helpful giving us information about the condo amenities and had information we took with us back to the condo about the area (shopping, actives, and attractions). Loved the condo and the location. I felt we got an excellent rate for a beach front condo complete with pool, hot tub, and a place with a full kitchen. It's a great place for not only families but couples. The condo was fully equipped and had 2 bathrooms making is nice for a not wait in line to take a shower at the end of the day. The relaxing view off the porch overlooking the Gulf is PERFECT for coffee in the morning, book reading in the afternoon and cocktails in the evening. It's a definite do again for us! Very friendly and helpful. Had to make the initial reservation by phone - easy and quick. The Pearl on Navarre Beach is an excellent vacation spot. Spacious, clean condo with balcony from living room and bedroom. 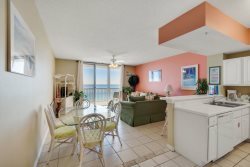 Great direct views of beach and gulf. Nice pool area with easy, private beach access. Small workout area is convenient and has sufficient equipment for an adequate overall workout. Overall, good value for the money spent. Thank you for everything our stay was amazing we will definetly be back! !